Check Out All the Different Style Stoves We have to Offer! Outdoor wood furnaces or outdoor wood boilers you see on this page are of top quality and come in 1/4 INCH steel or boiler plate steel. 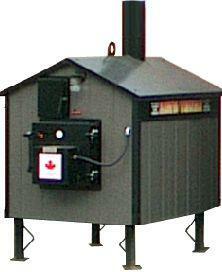 If you invest in an outdoor wood furnace it is important that your outdoor wood furnace is made of a quality design. 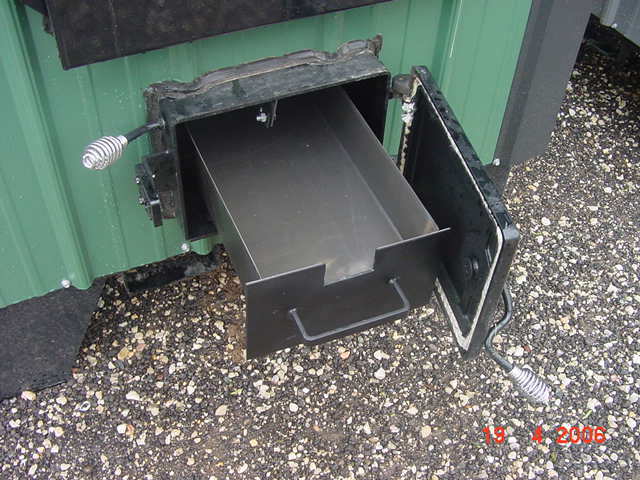 Our outdoor wood furnaces also have a shaker grate that allows for the easy removal & a smoke bypass that allows the smoke to go straight up the stack of your outdoor wood furnace and stops it from going in your face when you open the fuel door. 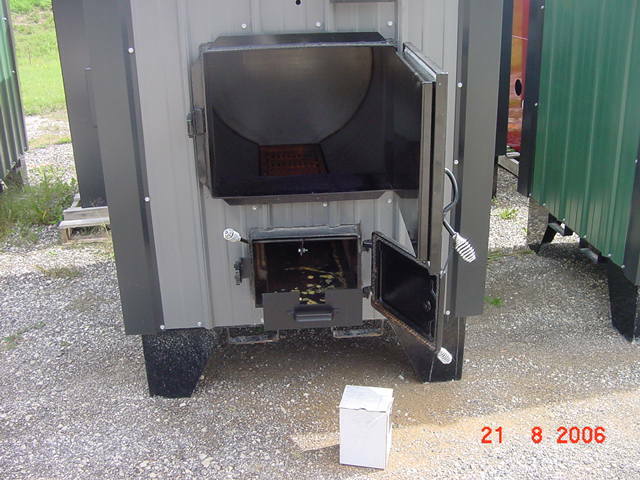 Our outdoor wood furnaces also have a pan for easy removal of the burned up ash. We are excited to offer a newly redesigned outdoor wood furnace - a new outer shell with the same quality you are use to from our previous models. The Royal water stove delivers premium performance, easy operation and long-lasting quality. Ideal for single-structure heating, the Royal water stove can be sized to your needs. The heating area which a stove can handle is affected by many factors such as; the heat loss of the building, climate, insulation, wind, type of wood or coal, moisture content of the wood, etc. 7200 56" x 57" x 94" 200,000 100Gallon 20" x 24" 1300 lbs. 26" 13.0 cubic ft. 2" ips 6"
7300 56" x 72" x 94" 300,000 145 Gallon 20" x 24" 1610 lbs. 43" 17.7 cubic ft. 2" ips 6"
7400 72" x 84" x 102" 500,000 380Gallon 24" x 32" 2500 lbs. 56" 50.0 cubic ft. 2.5" ips 8"
The stainless water stoves are sold complete with the following items: draft blower, aquastat and temperature gauge. Tubing, Water to Air Coils, Domestic Water Coils, Circulation Pumps, Additional supplies. Designed for safe trouble-free operation over a long service life, Pressurized Boiler Systems offer unique advantages to the homeowner seeking auxiliary or primary coal/wood burning system. All of our boilers are built to the exacting standards of the American Society of Mechanical Engineers (ASME). Every aspect of boiler design, material and construction is inspected by the Hartford Boiler Inspection & Insurance Company. Boilers are also inspected on-site by the National Board of Boiler and Pressure Vessel Inspectors and are continually checked by our quality control team. 6130 24" x 38" x 40" 130,000 23 Gallon 10" x 14" 780 lbs. 26" 6.25 cubic ft. 1.5" ips 8"
6150 26" x 38" x 48" 150,000 35 Gallon 10" x 14" 905 lbs. 26" 8.1 cubic ft. 1.5" ips 8"
6250 36" x 56" x 56" 250,000 135 Gallon 17" x 17" 1605 lbs. 43" 17.7 cubic ft. 2" ips 8"
The boiler is sold complete with the following items: draft blower, pressure relief valve, aquastat and pressure temperature gauge. Prorated 20-year limited warranty on boiler. Component parts carry the manufacturer's warranty. Our pressurized systems offer the greatest versatility in an outdoor heating system. Our pressurized systems are the unit of choice for homes, farms and business establishments demanding the best in wood or coal fired systems. Our welding personnel are required to pass the rigid ASME testing procedure to become certified. All of our boilers are built to the exacting standards of the American Society of Mechanical Engineers (ASME). Every aspect of boiler design, material and construction is inspected by the Hartford Boiler Inspection & Insurance Company. The boilers are also inspected on-site by the National Board of Boiler and Pressure Vessel Inspectors and are continually checked by our quality control team. 1/4" and 5/16" SA 36 steel assures safety and longevity. 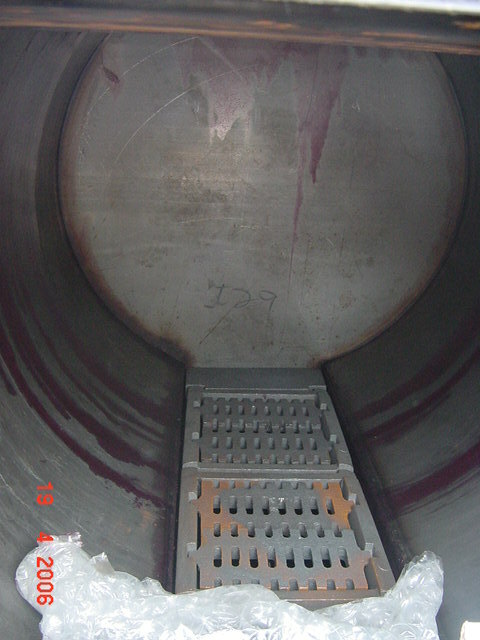 Heavy-duty cast iron grates and door eliminate warping. 6200 42" x 60" x 72" 200,000 90 Gallon 17" x 17" 1650 lbs. 26" 13.0 cubic ft. 2" ips 6"
6300 42" x 75" x 72" 300,000 135 Gallon 17" x 17" 2200 lbs. 43" 17.7 cubic ft. 2" ips 6"
6490 60" x 96" x 84" 490,000 260 Gallon 24" x 32" 4000 lbs. 56" 50.0 cubic ft. 2.5" ips 10"
Height to Chimney Top 84" 90" 103" 114"
Width 48" 57" 70" 83"
Length 72" 79" 90" 99"
Chimney Size 8" 8" 8" 10"
Door Size 18" X 17" 1" X 20" 25" X 24" 30" X 29"
Inlet / Outlet Sizes 1-1/2" 1-1/2" 1-1/2" 1-1/2"
Wood Length 36"-40" 44"-50" 56"-62" 69"-74"
1/4 INCH steel fire box and water jacket. Insulated chimney stacks are constructed of a high quality polished stainless steel. THIS LOWERS SMOKE IN THE OUTDOOR WOOD BOILER. Made from 1/4 INCH steel has a special rear air injection system. This system not only burns green wood but gives our OUTDOOR WOOD BOILER the quickest heat recovery time. THE ALL NEW AMERICAN LINE IS A ROUND FIRE BOX DESIGN WITH A UNIQUE SHAKER GRATING SYSTEM AND ASH PAN. THIS UNIT IS MADE FROM 1/4 INCH BOILER PLATE STEEL. The Inside Barrel of the B Series Stoves. It has a bypass baffle on top so the heat must make a second pass before going out the chimney.